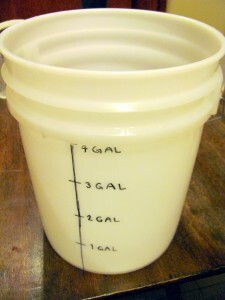 It’s not terribly precise, but it’s easy to mark the side of a bucket with gallon or liter measurements. You can see the liquid level right through the bucket. Having volume levels on your pail is useful for brewing, soap making, soil mixing, or any other application that uses ingredients that need to be measured. You could also mark a bucket off with inches or centimetres to gauge rainfall where you live, but I would use a lid with a hole drilled in it to prevent evaporation if you hope to measure rainfall over an extended period of time.